Summer temperatures in Perry Hall can dry out your landscape’s soil. That’s why it’s so important to figure out how healthy your soil is. Summer temperatures in Perry Hall can dry out your landscape’s soil. That’s why it’s so important to figure out how healthy your soil is. Here are some simple ways to do it. Part of determining soil health depends on how warm or cold the soil is. To make your plants grow, you will need the proper amounts of sunlight, fertilizer, and water. But nothing can grow if the soil is unhealthy or doesn’t have the right mix of nutrients. Take a soil thermometer and push it into the first few layers of topsoil. Make sure that the thermometer is inserted at least four inches deep, but not more than six. Look at the temperature reading and make a note of it on a piece of paper or your smartphone. Once you’re done, move onto other parts of your garden, lawn, or landscape and measure the temperature there too. Finding out how well your lawn drains is important as well. All of the recent rains have probably flooded your garden box and saturated your lawn, meaning you’ll have to spend more time cutting the grass. But mowing the lawn can be difficult if it isn’t draining correctly. Determining the drainage potential of your Perry Hall property calls for a percolation test. Get a shovel and dig into the ground where you’re looking to start a new garden. This replacement garden needs to be in a place where it won’t be washed out. Grab a shovel and dig foot-deep (about 12 inches) holes. Turn on your garden hose and spray water into each hole until each hole has been filled. Then let the water drain. Once the water has drained, refill the holes and use your watch or your phone to gauge how long it takes for all the holes to drain again. This is how you complete a percolation test. Lastly, you need to look at the results and think about what this means for your Perry Hall landscape. For best results, your soil needs to measure at least 45 degrees Fahrenheit, which seems rather cold. But that is the ideal temperature for cold weather seeds. 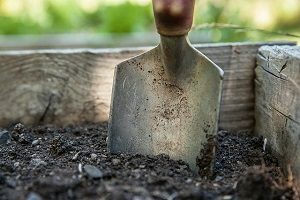 For warmer weather seeds, you need to have soil temperatures ranging between 65 and 85 degrees Fahrenheit, which shouldn’t be a problem during another long and hot summer here in Maryland. Trust Lehnhoff’s Supply and Design for All Your Soil Delivery Needs! This entry was posted on Thursday, July 26th, 2018 at 11:02 am. Both comments and pings are currently closed.